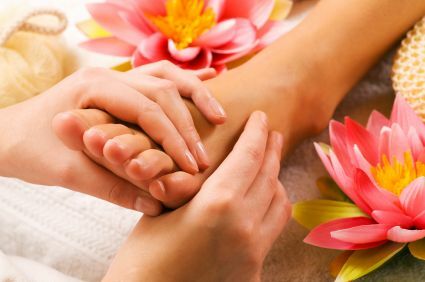 - "a touch can melt away your tension"
Indian Head Massage works on a physical and mental level. The release of tension from vulnerable areas such as the head, face, shoulders and neck, in turn unlocks trapped energy from the muscles. Blood flow is therefore increased resulting in the energising of the rest of the body. This energy release has a beneficial effect on our physical, mental and spiritual wellbeing. Simply being able to sit down and be still, with someones hands placed gently upon your head, can begin to disperse your stress and tensions almost immediately. The power of human touch cannot be underestimated. The treatment is energising as well as deeply relaxing leaving you feeling uplifted yet calm. Indian Head Massage is a very safe and beneficial therapy, but should not be used as a substitute for medical care. This wonderful therapy is comprised of massage of the head, neck, shoulders, upper arms and face. It is performed with you in a seated position and fully clothed. The only things to be removed are necklaces and earrings. If you prefer, a base oil can be used to facilitate smoother movements, in which case ladies can wear a strappy top for easier access to the upper back and shoulder area. The treatment lasts approximately 40 minutes. You will feel extremely relaxed and possibly sleepy afterwards and may need a couple of minutes to 'wake up'. This is perfectly normal.